As photos around the web show images of nationwide protests in reaction to the events in Ferguson, Missouri, one particular image has received widespread attention. Earlier this week, freelance photographer Johnny Nguyen captured a photo of 12-year-old Devonte Hart during a Ferguson-related rally in Portland, Oregon. 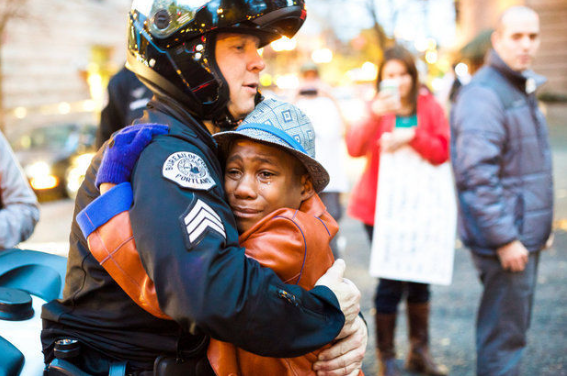 Hart, an African-American boy, was holding a sign that read “Free Hugs,” and the image Nguyen took shows Hart with tears streaming down his face while in a heartfelt hug with a white police officer. Nguyen said the photo has since been shared more than 400,000 times on Facebook and reposted on more than 68,000 Tumblr accounts. According to The Oregonian, which was the first outlet to publish the photo, the officer pictured in the image is Portland Police Sgt. Bret Barnum, who reportedly saw Hart holding his sign and called him over to engage in a quick conversation about the protest, school and life. Barnum then asked Hart for a hug — and it was during this moment that Nguyen captured the touching photo that he shared with the world. “I’ve been told this photo has become an icon of hope in regards to race in America,” Nguyen said. Following the protest, Hart’s parents — Sarah and Jen Hart — wrote a Facebook post that detailed more about their son and the events that led to the moment captured in the photo. As the photo continues to spread across the web, Nguyen said he hopes it will provide some people with a sense of peace along with a message of love and compassion. “In order to move on and progress toward real change, we need every reason for hope that can be garnered,” he said. In doing so, Nguyen reflects on one particular quote from civil rights leader Martin Luther King Jr. that he believes really drives the message home. Touching photo i have to say, but did the mother said “racism that is prevalent in our society?” prevalent? About 70% of Americans voted for Obama, and blacks constitute 12% of the U.S population so I don´t see systematic racism. It´s impossible to erradicate racism from all aspects of society, but certainly is not prevalent which is another way to say it´s systematic. The facts are just not there. I think the photo stands on its own, no words needed. Thank you for always pointing out what IS working and what IS right with this world. Thank you Theresa for the wondeful heartwarming photo. Archbishop Fulton J. Sheen tells a story of a leader of men. He tells them that he is going to teach them to hate. In the days that followed he did just that. Then he tested them. He had them stand side by side and began with the first on the left. He commanded him to strike the man next to him on the face. The man did as he was told. Then commanded the next. And he did so also. The third an fourth in line as well struck the one next to him. The fifth, however, refused to do as commanded. He refused to strike the man next to him. That is when hate stops. As shown in the photo we can stop harming others and ourselves either in thought, word or deed. We have it in us to change our hearts. Now we need leaders to do so as well. The only thing that stops them from encouraging an environment that would produce the results of the image above is they may have too much skin in the game. They seek vengence rather than reconciliation. “We have it in us to change our hearts.” So well thought out and spoken, Alan. I stand with you in this.